Lakeview adult female Scruffy (b/g, N/38) was killed in a territorial fight. Scruffy was born in 2007 at Firstar Center in Milwaukee, Wisconsin. 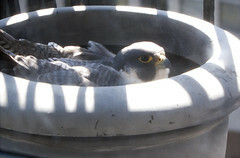 Firstar is the same nest that produced Evanston’s adult female “Nona” (b. 2004) and adult male Fast Eddie (b. 1989), who was one of the founding river birds. An interesting note about Scruffy. Her mother was actually an Evanston Library chick named Jean (b. 2005). Anyway, sad to see her go.